Today we have the pleasure of meeting up with author Phillip W. Simpson to talk about Minotaur (29 September 2015, Month9books, 278 pages) a Young Adult Mythological Historical novel. Hello Phillip, welcome to BooksChatter! Here at BooksChatter we love music, so Phillip has shared with us his music playlist for Minotaur, which includes the fantastic 1994 début album by Portishead - enjoy! What was the inspiration for Minotaur? "My love of ancient Greek myths! I also love history revisionism, even though this goes beyond the realms of history. To be honest, I read how Suzanne Collins was inspired to write the Hunger Games by reading the story of Minotaur and Theseus. This interested me so I re-read the myth again and as I was reading it, I had one of those ‘aha’ moments. I thought hang on, it doesn’t have to be like this. What if this isn’t the truth. Or the accepted ‘truth’." "I think my knowledge and background is reflected in the book. My undergrad degree was in Ancient History and Archaeology and my Masters (Hons) was in Archaeology. I’ve worked in museums and been on archaeological digs. I’ve also been a teacher for the last 13 years and often manage to weave in some myth and legend into my lesson plans." The first thing that draws me to a book is its cover. Can you tell us about your cover for Minotaur - why you chose that concept and who the artist is. "The one you see wasn’t the original concept. I initially came up with something rather more academic, an image taken from ancient Greek pottery featuring the Minotaur. Georgia McBride (publisher of Month9books) and I both liked it but we worried whether people would think it was a textbook on Greek pottery. The one we went with (which I love!) was a far more modern and menacing cover . I find it intriguing because there’s so much shadow. I couldn’t tell you who the artist is, sorry." I do like that cover as well, so I checked it out and the artist is Najal Qamber Designs. Why should we read Minotaur and what sets it apart from the rest? "Because this is told from the Minotaur’s perspective with the view that nothing from the myth was as people believed. I always find it much more interesting to take the perspective of an underdog or a minor character. Any book that takes the monster’s perspective is certainly different." Definitely - I want to hear his story! Can you tell us something quirky about Minotaur, its story and characters? "When I went into it, I didn’t know that the Minotaur’s original name was ‘Asterion’ which means ‘the starry one’ or ‘ruler of the stars’. He was venerated as a god by the Cretans." Who would you recommend Minotaur to and what should readers be aware of (any warnings or disclaimers)? "Anyone interested in ancient myths, particularly ancient Greek myths. Most people in other words (although I am a little biased – I just love myths). I grew up reading myths and legends. If you like different twists on commonly accepted stories. If you like somethings fast paced with a heart (I cried several times writing it). There’s love. There’s fighting. If you like those things, you’ll probably like the book. No warnings or disclaimers." If you could / wished to turn Minotaur into a movie, who would be your dream team? "I absolutely loved ‘Immortals’. The director was Tarsem Singh and I loved the lighting and the moody, washed out look of the movie. The fight scenes were incredible. I loved the way the gods and Titans were depicted. Interestingly, the movie was loosely based on the story of Theseus and the Minotaur too (with a sideline of the Gods vs the Titans thrown in for good measure). I think Henry Cavill (the new Superman) was a perfectly cast Theseus. As for Minotaur (Ast), it’ll have to be someone physically intimidating. Very large but with plain rather than good looks so I couldn’t use Chris Hemsworth (Thor) for example. They could ugly up Alex Pettyfer, I guess. Zoe Kravitz would be a good Phaedra." "I like tales of loss and betrayal but also stories of how characters can overcome adversity. I like rooting for the underdog, the character you didn’t expect to like, the one who is different – an outsider. I prefer to live in imagination land so I don’t write contemporary fiction, only fantasy and sci-fi. My last YA trilogy was a post-apocalyptic story of a half-demon boy left behind after the biblical Rapture. I’ll read anything post-apocalyptic (I love Cormac McCarthy’s ‘The Road’). I’m fascinated by myths and legends, demons and demonology so I read widely in those areas too." "I treat it like a job and it’s all about routine. I have a four year old son so I’m usually up at 6am. Workout first where I get my head into my book and my next scene . I try and write scenes in my head before I reach the keyboard. Theoretically, I should be sitting at my desk, fingers poised, at 8am. When I was teaching full-time, I could only write in the holidays so I’d aim for 4k words per day. This year, I try and do 2k a day. I write 500 words and then reward myself with a break in the form of a coffee or facebook. I always read and edit the previous day’s work first. It helps me focus on the next scene." "I’ve almost finished two YA novels based on Ancient history since MINOTAUR. The first is ARGOS which is the story of Odysseus’ loyal dog (told from the dog’s perspective). It fills in the twenty years after Odysseus departed for Troy. The second is a novel I’m still in the process of editing called TITAN. This is the novel I’m writing for my Masters in Creative Writing this year. It’s an origin story. It tells how Zeus went from a young man living in a cave on Crete to become the King of the Gods. I have a number of perspectives going with this one (including Prometheus – who gave fire to humans)." "I’m a huge dog lover. There’s a section in MINOTAUR about Ast’s love and friendship with a dog. I’ve had four dogs over the years. 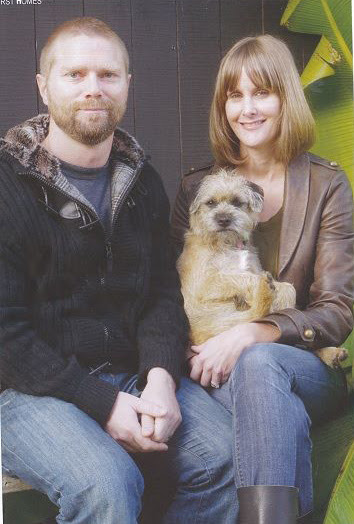 This is a picture with Raffles, our border terrier. We live with him and a female border, Whiskey." Lovely picture thank you for sharing it with us, and thank you for being with us today! I love mythology and look forward to Minotaur and your forthcoming works.